Thor Hammer measures 21 ½ inches in all with an 8 inch head. 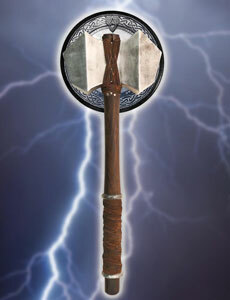 Ancient Thor Hammer, features a solid aluminum head and includes a round Viking shield display plaque. The dark color stained handle has steel rings which contrast against the suede wrap. The head of the Ancient Thor hammer measures 8 inches by 4 ¾ inch by 3 inch. These collectibles weigh approximately 4 pounds, 8 ounces. A suede lace braid contrasts against the metal hammerhead. Thor Hammer is 18 inches in all. 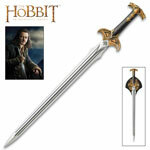 The head measures 8 ¼ inch by 1 ¼ inch thick. These replicas feature a genuine wooden shaft that has been hand stained. The shaft features brass rivets and a contoured suede wrapped grip. The Thor Hammer has solid metal parts and a solid metal head. The metal is antiqued giving the hammer an aged appearance. 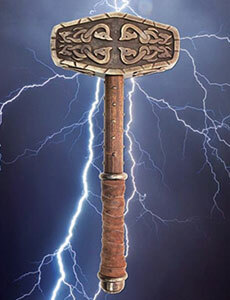 The Thor Hammer weighs approximately 4 pounds and includes a custom wall display plaque.